What we've accomplished is just the beginning. Since its founding at a small coffee shop on the campus of William and Mary in 2002, Virginia21 has consistently proven that millennials are a force to be reckoned with. Our successes validate Virginia21 and make it a viable, results driven organization for young people in the Commonwealth. One particular piece of legislation would have prohibited tuition revenue from supporting financial aid. While the bill was well intentioned , it's passage would have resulted in an immediate reduction of $86 million in available aid to in-state students. Before the bill could be reviewed, dozens of students representing all public colleges flooded the committee room to speak against cutting available financial aid. Seeing the overwhelming opposition to the legislation, the original patron introduced a substitute bill that was absent of any reductions to financial aid. . This session was commonly described as a "defense year" for higher education. One particular piece of legislation would have prohibited tuition revenue from supporting financial aid. While the bill was well intentioned , it's passage would have resulted in an immediate reduction of $86 million in available aid to in-state students. Before the bill could be reviewed, dozens of students representing all public colleges flooded the committee room to speak against cutting available financial aid. Seeing the overwhelming opposition to the legislation, the original patron introduced a substitute bill that was absent of any reductions to financial aid. The State Council of Higher Education in Virginia (SCHEV) released a report showing that the our state was meeting just 31% of financial need for in state students. Recognizing that the promise education and economic opportunity needed to be expanded, Virginia21’s student leaders pressured the Governor for increased funding to help close the achievement gap prior to session. After receiving numerous phone calls and petitions, the general assembly passed a budget that increased state financial aid by $50 million-- the largest increase since the reccession. We started the Save Our Slice campaign to oppose any further cuts to higher education. Through our students, we were able to successfully lobby the Governor and prevent any additional cuts to higher education this legislative session. In addition to higher education funding, we worked on the issue of campus sexual assault. We made progress by stopping legislation that would have been harmful to survivors and instead worked on policy that aims to help victims of sexual assault. Our Stop the Drop Campaign worked to reverse the trend of decreasing funds for the Virginia Student Financial Assistance Program (VSFAP). The petition drive made students’ voices heard in the General Assembly and led to a set of budget amendments totaling $30 million carved out for higher ed funding. In 2013 we launched our Student Leadership Institute in partnership with Christopher Newport University’s Wason Center for Public Policy to train a core group of student leaders. The advanced training program prepares participants to effectively educate thousands of students about higher education, economic development, and good government policies throughout the Commonwealth. Often lawmakers don’t listen to young people because the overwhelming majority of young people don’t vote. Virginia21 partnered with TurboVote, an online voter registration and election reminder service, to register students to vote on every campus across the Commonwealth. TurboVote’s email and text message alerts help get those students to the polls on Election Day. In less than one month, Virginia21 registered 2,500 students with TurboVote to make sure they never miss another election. In the run up to the 2012 budget session Virginia21 students organized a grassroots movement to make their voices heard to their elected officials. We sat down with Governor McDonnell, and students urged their representatives to invest in higher education, presenting over 14,000 petition signatures. The result was a hard-won $183.1 million increase in funding for higher education. That same year, lawmakers introduced new legislation to require a photo ID to vote. Various forms of photo ID were acceptable, including state-issued employee IDs, but not state-issued student IDs. That meant professors would be able to vote with their photo IDs, but students wouldn’t with the same ID. We wanted to ensure maximum access to voting for students, so we worked with legislators to make sure students would be allowed to vote with their school IDs, too. Virginia21 joined the Grow By Degrees Coalition composed of business, community, education, and economic development leaders and organizations to push the Commonwealth to make higher education a greater priority. That same year our “What’s Your Number?” campaign encouraged students to use their debt as a tool to advocate for increased funding for higher education. As part of the effort, students organized campus events and tweeted at Governor McDonnell how much debt they owed to make the true cost of education clear. Additionally, we collected over 10,000 signatures to encourage legislators to put more money towards financial aid and lower student loan debt. Virginia21’s advocacy efforts helped pave the way for the Virginia Higher Education Opportunity Act, also known as the Top Jobs for the 21st Century Act. The Act focused on increasing the levels of graduates, especially in STEM fields, in part by increasing the affordability of college. Virginia21 wasted no time in its ﬁrst year working with the community college system by supporting the idea of a transfer grant to increase accessibility to higher education. Recognizing that it is vital to keep college affordable and accessible, Virginia21 sought out students to make the case. In one week, 7,500 community college students who had never organized before signed petitions in support of the campaign. An additional 1,000 students called their delegates and senators to alert them to the importance of this issue. The result was the creation of the ﬁrst transfer grant program in the country. 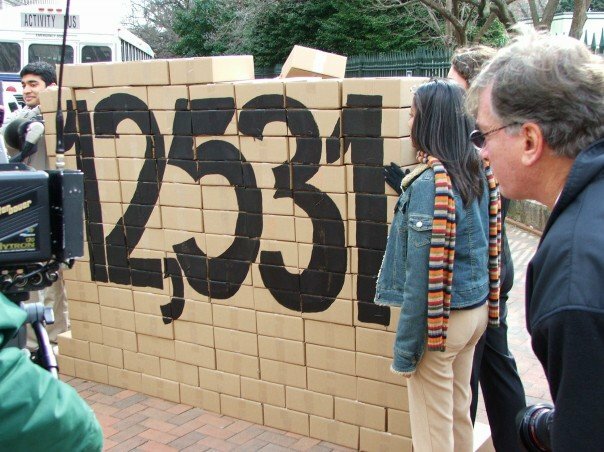 In 2006 Virginia needed to fund every student an extra $1,246 for tuition to remain flat. To highlight this among students, Virginia21 collected over 12,000 petition signatures and stacked them in boxes outside the entrance to the General Assembly Building. When delegates and senators left the building, students would hand them their district’s box of signatures telling them to support higher education that year. Virginia21 created a market based solution to help aid students with the rising costs of textbooks. After a General Assembly study showed that students could save as much as 40%-60% by comparison shopping, over 300 students showed up to pack a committee hearing room to ensure that the General Assembly addressed the issue of textbook fairness. Students won the right to have their book lists before classes start. Student leaders collected over 200,000 pennies, nearly 1-ton, and presented them to the state treasury. Each penny represented a student who wanted the General Assembly to invest in higher education. By the end of the session, lawmakers invested $275 million new dollars for higher education funding. The organization now known as Virginia21 came to life when a group of students realized that young voters needed a seat at the table. They found their vehicle in 2002 by starting the “Students PAC” to support higher education leaders in Virginia with the passage of a major higher education bond referendum. It began by registering students to vote at one campus and quickly turned into the country’s and the Commonwealth’s first generational advocacy group for young voters.